It’s a big day! 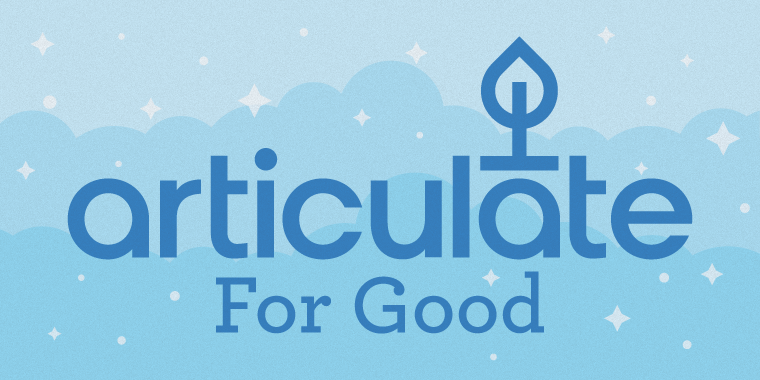 We are so excited to announce the first-ever Articulate for Good grant award winners. We’ll be helping these nonprofits to tackle their important projects with grants of cash, Articulate software, and training (thanks to our partners at Yukon Learning). Since we announced this new program in September, we’ve received more than 30 applications from nonprofits working on job training, health, environmental, and educational programs all over the world. We loved learning about all of these amazing organizations and the compelling ways they’re incorporating e-learning in their programs. BUILD helps prepare young people from under-resourced communities for high school, college, and career success. BUILD helps kids develop and run their own small businesses to supplement traditional school curricula with real-world business experience. BUILD will use Articulate software to create and deliver training for BUILD classroom teachers. This training will help spread BUILD’s programs throughout the U.S. to reach more kids. Corporate America Supports You (CASY) helps connect National Guard, reserve, transitioning military members, and veterans with job skills training. CASY offers tons of programs for veterans, including resume, interview prep, networking, and direct hire opportunities for job-ready applicants. CASY has traditionally provided its training through live webinars, but with support from Articulate for Good, CASY will begin converting its content to self-paced, online training. The Global Lives Project highlights the common elements of the human experience by capturing 24 continuous hours of video in the lives of ordinary individuals. Global Lives will use Articulate software to create educational programs to encourage discussion about different cultures, languages, and religions all over the world. OneSky organizes training programs in China to help caregivers and orphanage administrators care for young children during their critical early stages of development. With help from an Articulate for Good grant, OneSky will create online training programs to help caregivers learn to care for little ones in nurturing, loving ways. Project WET Foundation creates and delivers water education programming all over the world to help communities boost their health, conserve water, and protect their local environments. Project WET Foundation has already created five online training sessions focused on hand-washing, soap basics, disease prevention, water conservation, and watershed education. With support from this grant, Project WET Foundation will create new courses to train trainers who provide sanitation and hygiene education to adults teaching in local Sri Lankan and Haitian schools. Upwardly Global offers job training and services for skilled immigrants and refugees, helping integrate these folks into the U.S. workforce. With support from Articulate for Good, Upwardly Global will create an employment readiness and job search curriculum that will help learners improve their resumes, interview skills, and much more. YearUp is a year-long training program that helps urban young adults gain job skills and experience. It also helps connect these youth to hiring companies. Using Articulate software, YearUp will train staff on how to more effectively help young people prepare for and find meaningful employment. We’re thrilled to see what these grant recipients do with support from Articulate for Good! Of course we’ll keep you posted on their results. Thanks so much for helping us spread the word about this program, and thanks to all the applicants for sharing your inspiring projects with us. We plan to offer Articulate for Good grants regularly, so please add your email address here to stay in the loop about news and funding opportunities.